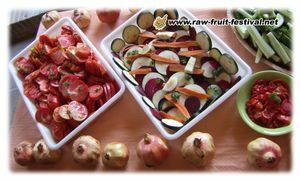 Why the Raw Fruit Festival, rawfood in Andalusia? Why a festival in Andalusia? Stéphane and Claire have been living in the area for several years, following a raw fruit based diet since 2004. They own a small farm in the Genal valley, where they live with their two sons, after leaving their scientific careers for ethical reasons and in order to live closer to nature. You can know more about them here. 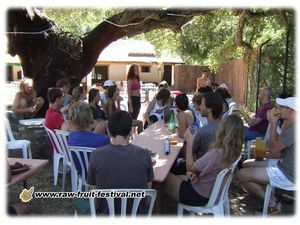 Knowing and loving the region, they decided to share this valley with the rest of the raw-food community by organizing a festival centered on fruits, and meeting in a natural setting. No speakers are invited to talk at the festival as a choice of the organizers. But of course, they can join everyone at the festival! This is deliberate, and done in order for all the participants to feel free to talk and share with everyone without the pressure of the group. And the fruits and vegetables provided at the festival are so fresh and ripe and high quality that they speak for themselves!!! And the surrounding nature and sport activities offered too! Of course, their farming experience gives them the ability to offer the best season for such a meeting, with a great diversity of local fruits, and a very enjoyable climate. On top of that, their farmer friends in the area will help them to source the best-quality fruits possible for the Festival. So, the Festival will be held when the weather is great, and the fruits are at their best! How does it sound? Visits of the farm are also organized in order for the participants to go pick some of the food for the festival, like figs, greens, fresh corn. The Festival is meant to be a place for meeting new friends, while enjoying activities in nature during the week. The organizers deliberately chose not to plan formal talks. We do not wish to promote anyone’s particular message, and we prefer to let participants draw their own conclusions from their experiences and conversations, to talk and/or to listen freely. The quality of the food, the peacefulness of the surrounding nature will help everyone to find their path. Be assured that non-formal discussions, rich in information, will spontaneously arise during the Festival, as participants grow better acquainted, as it was experienced by the participants of the Raw Fruit Festival. One of the Festival’s goals is to meet people and to exchange ideas. Activities will be planned to facilitate participants getting to know each other. Everything will be done so that the participants meet each other, and have time to talk and share.